Musician Joni Mitchell Is 'Awake And In Good Spirits' In Intensive Care : The Two-Way The folk music icon was hospitalized in Los Angeles after being found unconscious in her home Tuesday. 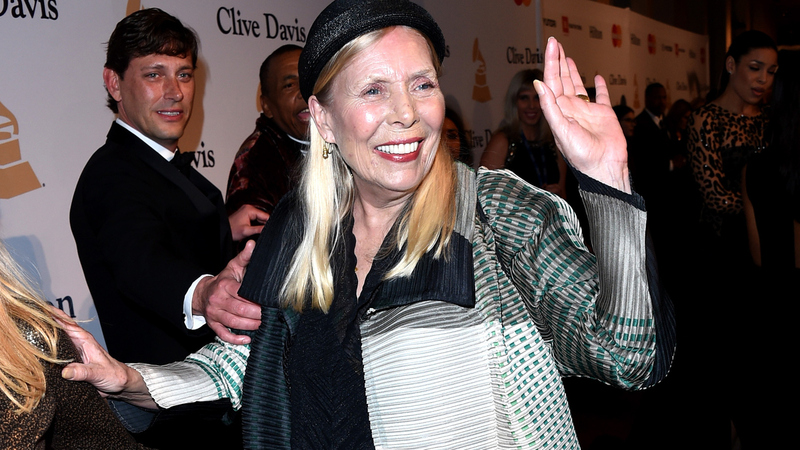 Musician Joni Mitchell attends a party before the Grammy Awards in February. Mitchell, 71, was found unconscious in her home Tuesday. After being found found unconscious in her home Tuesday afternoon, folk music icon Joni Mitchell has been hospitalized in Los Angeles. "She is currently in intensive care undergoing tests and is awake and in good spirits," according to her website. Mitchell "regained consciousness on the ambulance ride," her website says. No other details have emerged about why the 71-year-old singer required medical attention. We'll update this post with any news that emerges about Mitchell's condition. The eight-time Grammy winner has written songs such as "Chelsea Morning," "Help Me" and "Big Yellow Taxi," and she recorded classic albums such as Blue and Clouds. She was inducted into the Rock and Roll Hall of Fame in 1997. In December, Mitchell spoke to Morning Edition in a lengthy interview covering matters from what she calls her "helium voice" to her struggle with polio as a child in Canada.